I LOVE this product! I would have never known it existed had it not been for COOLA’s awesome publicist. Thank you Jessica for turning me on to COOLA’s Natural Body and Hand Lotion Bars. We all struggle with dry skin during the winter months and, if you are like me, you constantly find yourself applying and reapplying lotion throughout the day. The great thing about COOLA lotion bars is one application lasts for hours. 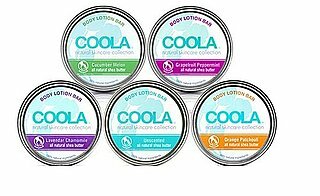 COOLA’s unique Natural Body and Hand Lotion Bars are made from exotic pure butters that maintain a sold form at room temperature. All you have to do is gently rub the bar on your skin and your body temperature will naturally melt the lotion, which is quickly absorbed so you’re left with soft and silky skin and no greasy residue. Due to the product’s design there is no waste and the packaging makes them ideal for travel. The bars are made from beeswax, shea butter, jojoba extract, vitamin E and almond and avocado oils. They feature natural scent combinations such as lavender chamomile, grapefruit peppermint, orange patchouli, cucumber melon, and unscented. The scents are very light and not at all overpowering. My favorite is the cucumber melon. The Natural Body Bar is perfect for your feet and does wonders for cracked heels. I like the fact that I can apply it before putting on my stilettos and not have to worry about my feet sliding around my shoes. I also heard that you can use the product on your hair to help manage dryness and frizz. I gave it a test run and it worked. COOLA’s Natural Body and Hand Lotion Bars are great. They will definitely become a staple and the packaging and price also makes them perfect for gift giving.